Barabbas: I saw the body. He was a dead man. Peter: If you were sure of that, you wouldn't be here. One of the peculiar subgenres of the epic is the quasibiblical film that tells its story on a tangent leading off from the passion story of Jesus. Among these are The Robe, Demetrius and the Gladiators and of course, Ben-Hur. A late entry in this group is Dino de Laurentiis' production of Barabbas, based on a novel by Nobel-prize-winning author Par Lagerkvist. As part of the traditions of Passover in early first century Jerusalem, a prisoner is to be released by the demands of the crowd. Pontius Pilate (Arthur Kennedy) offers the crowd Jesus, but they instead demand the release of Barabbas (Anthony Quinn), a thief and assassin. His initial plan is to return to his life of crime, but his girlfriend, Rachel (Silvana Mangano) becomes a Christian and suffers stoning for her beliefs, triggering a spiritual search by Barabbas. 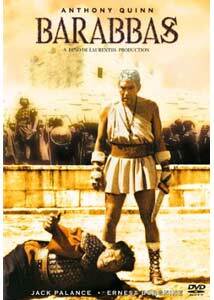 Brought again before Pilate, he is sentenced to the sulfur mines, where he meets a Christian, Sahak (Vittorio Gassman). Barabbas later ends up in a gladiatorial school run by the sadistic Torvald (Jack Palance), where he meets his final destiny. Unlike the daintier entries in the subgenre, Barabbas is willing to show Jesus onscreen. Interestingly, however, it sidesteps the issue of the resurrection by showing the empty tomb but never showing a risen Jesus, keeping an essential ambiguity in the mind of the central character. This ambiguity is vital to his alternating acceptance and rejection of Christianity, and in an astonishingly subversive move, finally leads to Barabbas accepting Christianity through an apocalyptic delusion that causes him to aid in the burning of Rome! Shades of David Koresh.... Barabbas is told by Pilate that Rome cannot put him to death since he was previously released as a Passover prisoner, but this translates in Barabbas' mind to the idea that he literally cannot die, which keeps him alive for years in the sulfur mines when men die there after short periods of time, indicating the power of belief, regardless of whether there is any validity to the belief. The Lazarus presented here looks as if he is still quite dead, or possibly a zombie, which seems to me to be presenting a rather mixed message; furthermore, he has nothing to say about death and speaks only in platitudes. Because of the poor dubbing, it's difficult to dispassionately assess the performances here. Quinn seems to be mostly wooden, though often that's appropriate to the stoic character he's playing. He does have an undeniable magnetism in the role. Veteran British actor Harry Andrews does a fine job as Peter, though poor Ernest Borgnine not only has a part that barely registers as a cameo, but he seems to be dubbed by someone else. The Italian cast is uniformly awful, with Vittorio Gassman leading the pack of the stiff and unnatural performances. Gassman rattles off his lines about the love of God with utter insincerity and does not convince in the least. He's not quite as bad as Stephen Boyd in Ben-Hur, but he's darn close. Jack Palance is way, way over the top in one of his patented maniacal performances. The cinematography is interesting and uses the full width of the screen well; there are ample opportunities to show off, such as the crucifixion sequences and the Colosseum. The screenplay by Christopher Fry is one of the great strengths of the piece, with the theme of blindness and dazzling light used sensitively throughout. In all, this makes for an intriguing look at religion and spirituality, almost from a Dostoevskian perspective. Image Transfer Review: The anamorphic widescreen picture is fairly well detailed, without notable edge enhancement. Unfortunately, the source print is very badly faded to red. Much of the time, the sky is pinkish rather than blue. A few sequences do have bright and realistic color, possibly as a result of being spliced in from another print or color-enhanced somehow. Skin tones are orange through most of the film. However, black levels and shadow detail are both acceptable. The transfer itself is fine, but the source material is not, which drags down what would otherwise be a fairly high grade. Audio Transfer Review: The audio is billed as DD 4.0, but I didn't hear any significant surround activity and the sound seemed to be coming almost entirely from the center speaker. Hardly an enveloping experience, the sound is quite clear and without hiss or noise. The music does suffer from some distortion, have a very tinny or canned feel to it, lacking in depth and bass frequencies. Heavy dialogue normalization is also used, resulting in very low level sound that will have the viewer cranking the volume. Extras Review: The sole extra is a very wide trailer that looks to be about 2.76:1, presented nonanamorphic. Chaptering is decent, and the layer change is on a fade to black. However, the layer change also comes in the middle of a musical cue, leading to an audible interruption though not a visual one. If Ben-Hur leaves you wanting more in the way of a religious epic, you've come to the right place. An unfortunately poor source print limits the enjoyment, however, and the audio is no great shakes. Worth a rental, though, for those interested in the mechanics and motivations of belief, Barabbas is deeper than the usual such fare.